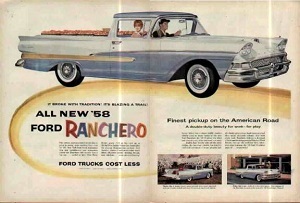 Ranchero advertising part 1: a Car or a Truck? 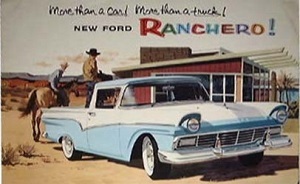 The noun Ranchero is associated with nineteenth-century Hispanic California history. A Ranchero was a man who owned a big tract of land. 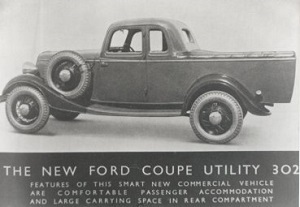 In the late 1950s however, the word took on a new meaning: a light pickup built by Ford using automotive components instead of truck components. Ford built this vehicle in various styles from 1957 to 1979. The Chevrolet version starting later was the El Camino, interestingly another Hispanic word. The problem faced by Ford's advertising team was how to market this new class of vehicle. A 1958 ad describes the Ranchero as a “double-duty beauty.” Also, it is the “Finest pickup on the American Road” and “Ford Trucks Cost Less.” These are classic advertising slogans. This was the decade of James Dean and Elvis Presley, of Sputnik, Davy Crockett hats, and Rock and roll. In keeping with this spirit, the ad also states, “It broke with tradition! It's blazing a trail!” Advertising has changed with the advent of the internet and online reviews. New car model reviews and Titlemax reviews provide consumers more information than any advertising slogan ever could. The trail was actually blazed in the early 1930s by Lew Bandt of Ford in Australia, who designed a utility truck with an enclosed cab instead of flimsy canvas cover in response to a letter from a farmer's wife who asked “Why don't you build people like us a vehicle to go to church in on a Sunday, and which can carry our pigs to market on Mondays?” Lew designed a vehicle with the front half of a sedan and the rear half from a light truck. 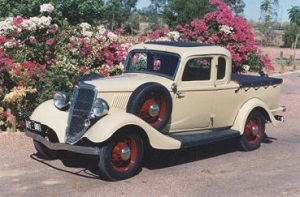 The Coupe Utility (“Ute”) has been produced ever since to this day and has been copied all over the world. (both pictures above courtesy www.fastlane.com.au). Notice the selling points on the cover of the first brochure: comfort and capacity. 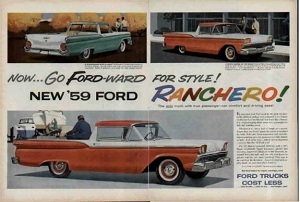 In 1959, the slogan was “NOW…GO FORD-WARD FOR STYLE.” The ad emphasizes that the new 1959 Ford Ranchero is “the only truck with true passenger-car comfort and driving ease.” Notice the underlining of the word only, to emphasize the uniqueness of this particular vehicle. It happens that 1959 was the year Chevrolet first offered the El Camino, their version of this class of vehicle.